The term electromagnetic induction refers to the generation of an electric current by passing a metal wire through a magnetic field. The discovery of electromagnetic induction in 1831 was preceded a decade earlier by a related discovery by Danish physicist Hans Christian Oersted (1777–1851). Oersted showed that an electric current produces a magnetic field. That is, if you place a simple magnetic compass near any of the electrical wires in your home that are carrying a current, you can detect a magnetic field around the wires. If an electric current can produce a magnetic field, physicists reasoned, perhaps the reverse effect could be observed as well. So they set out to generate an electric current from a magnetic field. That effect was first observed in 1831 by English physicist Michael Faraday (1791–1867) and shortly thereafter by American physicist Joseph Henry (1797–1878). The principle on which the Faraday-Henry discovery is based is shown in the figure on page 762. A long piece of metal wire is wound around a metal bar. The two ends of the wire are connected to a galvanometer, an instrument used to measure electric current. The bar is then placed between the poles of a magnet. Electric current: A flow of electrons. Electrical generator: A device for converting mechanical (kinetic) energy into electrical energy. Galvanometer: An instrument used to measure the flow of electric current. Potential difference: Also called voltage; the amount of electric energy stored in a mass of electric charges compared to the energy stored in some other mass of charges. Transformer: A device that transfers electric energy from one circuit to another circuit with different characteristics. As long as the bar remains at rest, nothing happens. No current is generated. But moving the bar in one direction or another produces a current that can be read on the galvanometer. When the bar is moved downward, current flows in one direction through the metal wire. When the bar is moved upward, current flows in the opposite direction through the wire. The amount of current that flows is proportional to the speed with which the wire moves through the magnetic field. When the wire moves faster, a larger current is produced. When it moves more slowly, a smaller current is produced. Actually, it is not necessary to move the wire in order to produce the electric current. One could just as well hold the wire still and move the magnetic poles. All that is necessary is the creation of some relative motion of the wire and the magnetic field. When that happens, an electric current is generated. Many electrical devices operate on the principle of electromagnetic induction. Perhaps the most important of these is an electrical generator. An electrical generator is a device for converting kinetic energy (the energy of an object due to its motion) into electrical energy. 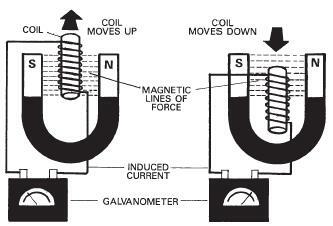 In a generator, a wire coil is placed between the poles of a magnet and caused to spin at a high rate of speed. One way to make the coil spin is to attach it to a turbine powered by water, as in a dam. Steam from a boiler can also be used to make the coil spin. As the coil spins between the poles of the magnet, an electric current is generated. That current then can be sent out along transmission lines to homes, office buildings, factories, and other consumers of electric power. the current that comes from a power plant is typically high voltage current, much higher than is needed or than can be used in household appliances. A step-down transformer uses electromagnetic induction to convert the high voltage current in power lines to the lower voltage current needed for household appliances. this article is a nice one.it clears all the basic concepts about electromagnetic induction n also provides lot of information about it. this page is very informative.. i like it .. i understand so much what is electromagnetic induction..
why electro magnetic indeuction can prevent a magic of magnetism? i think this site is very interesting,this will be my quest. i give detail about electro-magnetic operat gear shifting mechanisum in two wheler. u made this so easy to understand, im only 14 and i understand this perfectly, though can u make a forum on magneto - electric induction so i may understand that a little better. However, i still have questions about how the induced current within a transformer converts electricity from a high voltage current to a smaller one such as one in homes, can you further expalain? This just saved me from completely failing my first year at college haha! so yeah whoever puts all this up your a legend :) SAFE! it is very helpful for me to done my assignment.I also want to know about instruments working with electromagnetic induction.